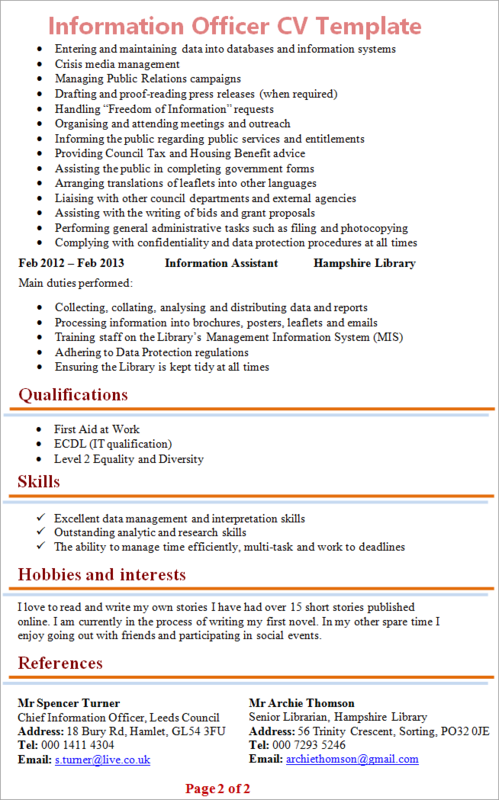 Tip: Use the Information Officer CV Template below as an example to help you write your own personal and fully-tailored CV. I am a hardworking, intelligent and customer and community focused Information Officer with more than three years of experience in managing medical, technical, statistical, financial and general information. I am a practical individual who enjoys working within a team and can also work very well without supervision. I have a passion for analysing data and presenting my findings to staff and customers alike. 2002 – 2009 GCSEs Bexley School Results: 13 GCSEs at Grades A*-C.
I love to read and write stories, and I have had over 15 short stories published online. I am currently in the process of writing my first novel. In my other spare time, I enjoy going out with friends and participating in social events. Presenting and conveying information is one of the most important aspects of this job and should make it clear on your CV that you have experience of doing this (even if it was on projects in College or University). You should demonstrate excellent research and analytical skills by giving real-life examples of how you utilised these skills when it comes to gathering, analysing, distributing and presenting information. CV with No Experience: It is adventitious, in fact, it is usually an essential requirement, that you have some kind of experience with information-related processes. Volunteering in entry-level positions such as Information Assistant or Library Assistant will enable you to get a feel of a job and gain good work experience which will prepare you for the Information Officer job.